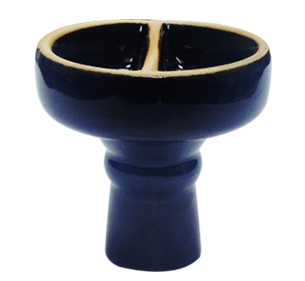 Enhance your Hookah experience with a Double Compartment Hookah Bowl. With many different colors to choose from, we're sure to have the specific bowl that will match your Hookah.This bowl is made out of ceramic with a clean, high shine glaze. Double Compartment Bowls are very durable and allow for an easy and convenient way to mix up a variety of hookah tobacco flavors in exact 50/50 proportions. These bowls are made to work with most Hookah models in the industry. The Double Compartment Hookah Bowl can hold up to approximately 25 grams of Flavored Tobacco.